1. To make the lemon hollandaise, place the butter and lemon juice in a small saucepan and melt over a low heat until bubbling. Whisk the yolk and a pinch of sea salt in a bowl, then very slowly trickle in the butter mixture, whisking throughout until thick. Set aside and keep warm. 2. Place the spinach with a tablespoon of cold water and seasoning into the butter pan and return to a high heat. Cover and cook for 1-2 minutes or until just wilted, then drain, set aside and keep warm. 3. Meanwhile, boil a small pan of water and add the vinegar. Crack in the eggs and poach very gently until the whites are cooked through. Remove with a slotted spoon and drain on kitchen paper. 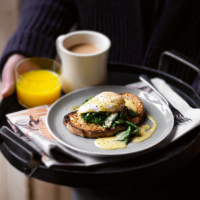 At the same time, toast the bread until golden, then top with wilted spinach followed by the poached egg and drizzle with the warm lemon hollandaise. Season with some freshly ground black pepper before serving.